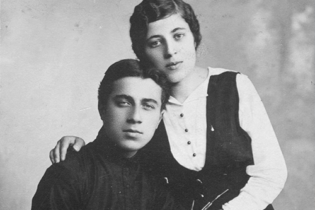 1899 Ervand Kocharian (Kochar) was born in Tbilisi on June 15 to the family of Simon Kotcharian (1866-1933) of Shushi and Pheocla Martirosian (1873-1951). 1909-1918 Studies at Nersissian School, at the same time attends the Arts School of the Caucasus Association for Promoting Fine Arts (Schmerling School). 1918-1919 Studies at Moscow Second State Free Fine Arts Studios, P. Konchalovsky’s studio. 1919-1921 Teaches painting at Tiflis high schools. 1919-1920 Participates in the “Second and Third Autumn Exhibitions” and the “Малый круг” (Small Circle) exhibition organized by the Association of Georgian Artists (Tiflis). 1921 Receives a certificate of State Higher Arts and Technical Studios Professor. 1922 In April leaves for abroad, Constantinople, where opens a one man show on 14 June. In November arrives in Venice, the Mkhitarist Congregation, teaches at Mourad-Rafaelyan College, creates the face sculptures of Cardinal La Fontaine, Father Kyureghian, the poet Avetik Issahakian, and studies the rich collection of the Congregation’s old Armenian miniature art. Visits the museums of Padua, Rome and Florence.